Weapons: Midnight is armed with various daggers, throwing stars, and nunchucks. M’Nai was born in a village located in Africa to parents who were agents of Fu Manchu, who operated a base from there. When the base was assaulted by Sir Denis Nayland Smith, M’Nai’s parents were killed in the raid and M’Nai was orphaned as an infant. An aide of Fu Manchu found M’Nai in the wreckage and saw the scars on his face from the fire. The aide wanted to put the crying infant out of his misery, but Fu Manchu stopped him. Fu Manchu realized that the child was not crying from pain, but from hatred towards those who caused the death of his parents. Fu Manchu took the child back to his fortress and raised him like a son alongside his other son; Shang Chi. M’Nai wore a mask to cover his scars. At the age of seven, Shang Chi ask M’Nai to remove the mask. M’Nai refused and the boys dueled. The fight was a stalemate, and the two became good friends (Special Marvel Edition #16). When M’Nai was 15 he was accused of stealing from Fu Manchu. M’Nai’s accuser was on of Fu Manchu’s trusted aides, and told Shang Chi and on of Fu Manchu’s other aides his accusation. M’Nai and Shang Chi fought when M’Nai approached Shang Chi about what he had been told. The two were able to put aside their difference and find the real thief. They tried to tell the other aide but was not believed. Shang Chi felt that Fu Manchu set the whole thing up to see if the boys would turn on each other. (Master of Kung Fu #41; June 1976) M’Nai’s first assignment was to go extend an invitation to the villain known as Half-Face to join Fu Manchu’s Si Fan. After fighting his way into Half Face’s home, M’Nai; now as Midnight; extended the offer, but was refused. Midnight felt sympathy towards Half Face because they both were disfigured. (Iron Man Annual #4; 1077) Shang Chi was sent by his father to assassinate an individual, in which Shang Chi refused. This act was the end of both his relationship with his father and M’Nai, who he felt was his brother. Shang Chi left and was located by Fu Manchu in New York. Fu Manchu sent Midnight after Shang Chi. When they first faced each other, he could not bring himself to fight Shang Chi, who he still considered a friend. When Midnight told Fu Manchu about this, Fu Manchu told him Shang Chi was a traitor and no longer his friend. Midnight found him again and tried to kill him. During the course of the fight, Midnight attempted to kick Shang Chi while they were on a winch and Shang Chi evaded the kick. Midnight’s momentum carried him over the edge and to his death. Midnight’s cape was snagged on the winch’s hook and snapped his neck (Special Marvel Edition #16). Right before his death, Midnight was grabbed by Kang into the time stream. 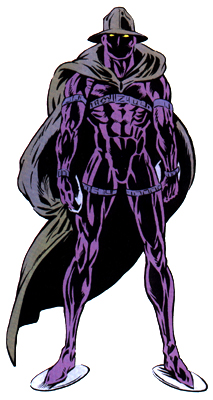 Kang employed him in his Legion of the Unliving, which attacked the Avengers. Midnight fought Mantis to a standstill, and Mantis was able to flee. Midnight caught up with Mantis, but was defeated and sent back to his proper place in time by Immortus (Avengers #132-132; January-February 1975; Giant Size Avengers #3; February 1975). I can’t say I know of this character all that much but I was a big fan of the Silver Surfer comic with Ron Lim at the artistic helm of book. I see some of Mr. Lim’s work is featured in your gallery of the Midnight Sun and Silver Surfer. I will need to dig into my stash to see if I have any issues with Midnight Sun featured. Thanks for the bio.